"ABV" redirects here. For other uses, see ABV (disambiguation). 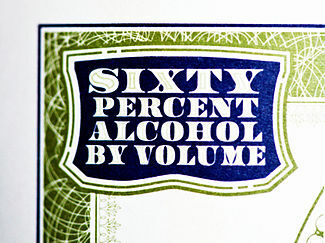 The alcohol by volume shown on a bottle of absinthe. Alcohol by volume (abbreviated as ABV, abv, or alc/vol) is a standard measure of how much alcohol (ethanol) is contained in a given volume of an alcoholic beverage (expressed as a volume percent). It is defined as the number of millilitres (mL) of pure ethanol present in 100 mL (3.4 fl. oz) of solution at 20 °C (68 °F). 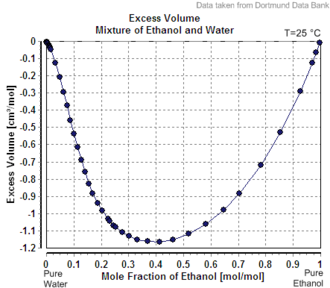 The number of millilitres of pure ethanol is the mass of the ethanol divided by its density at 20 °C, which is 0.78924 g/mL (105.3 fl oz/gallon). The ABV standard is used worldwide. The International Organization of Legal Metrology has tables of density of water–ethanol mixtures at different concentrations and temperatures. In some countries, e.g. France, alcohol by volume is often referred to as degrees Gay-Lussac (after the French chemist Joseph Louis Gay-Lussac), although there is a slight difference since the Gay-Lussac convention uses the International Standard Atmosphere value for temperature, 15 °C (59 °F). Mixing two solutions of alcohol of different strengths usually causes a change in volume. Mixing pure water with a solution less than 24% by mass causes a slight increase in total volume, whereas the mixing of two solutions above 24% causes a decrease in volume. [a] The phenomenon of volume changes due to mixing dissimilar solutions is called "partial molar volume". Water and ethanol are both polar solvents. When water is added to ethanol, the smaller water molecules are attracted to the ethanol's hydroxyl group, and each molecule alters the polarity field of the other. The attraction allows closer spacing between molecules than is usually found in non-polar mixtures. Thus, ABV is not the same as volume fraction expressed as a percentage. Volume fraction, which is widely used in chemistry, is defined as the volume of a particular component divided by the sum of all components in the mixture when they are measured separately. To make a 50% v/v ethanol solution, for example, you would measure 50 mL of ethanol and separately measure 50 mL of water, then mix the two together. The resulting volume of solution will likely not measure 100 mL due to the change of volume on mixing. Details about typical amounts of alcohol contained in various beverages can be found in the articles about them. Another way of specifying the amount of alcohol is alcohol proof, which in the United States is twice the alcohol-by-volume (ABV) number. This may lead to confusion over similar products bought in varying regions that have different names on country specific labels. For example, Stroh rum that is 80% ABV is advertised and labeled as Stroh 80 when sold in Europe, but is named Stroh 160 when sold in the United States. In the United Kingdom proof is 1.75 times the number (expressed as a percentage). For example, 40% abv is 80 proof in the US and 70 proof in the UK. However, since 1980, alcohol proof in the UK has been replaced by ABV as a measure of alcohol content. In the United States, a few states regulate and tax alcoholic beverages according to alcohol by weight (ABW), expressed as a percentage of total mass. Some brewers print the ABW (rather than the ABV) on beer containers, particularly on low-point versions of popular domestic beer brands. At relatively low ABV, the alcohol percentage by weight is about 4/5 of the ABV (e.g., 3.2% ABW is about 4% ABV). However, because of the miscibility of alcohol and water, the conversion factor is not constant but rather depends upon the concentration of alcohol. 100% ABW is equivalent to 100% ABV. During the production of wine and beer, yeast is added to a sugary solution. During fermentation, the yeasts consume the sugars and produce alcohol. The density of sugar in water is greater than the density of alcohol in water. A hydrometer is used to measure the change in specific gravity (SG) of the solution before and after fermentation. The volume of alcohol in the solution can then be estimated. There are a number of empirical formulae which brewers and winemakers use to estimate the alcohol content of the liquor made. 1.05 is the ratio (by mass) of ethanol molecules produced for every molecule of CO2 produced[dubious – discuss] (46.07 g/mol C2H6O / 44.01 g/mol CO2 = 1.0468) from a single molecule of glucose. The number 0.7936 is the specific gravity of a 100% ethanol solution. Both are unit-less measurements. The difference between the starting SG and the final SG measures the specific gravity lost to CO2 release. ^ See data in the CRC Handbook of Chemistry and Physics, 49th edition, pp. D-151 and D-152. Mixing a solution above 24% with a solution below 24% may cause an increase or a decrease, depending on the details. ^ "Lafayette Brewing Co". www.lafayettebrewingco.com. Archived from the original on 2012-02-19. Retrieved 2012-02-04. ^ "Glossary of whisky and distillation". www.celtic-whisky.com. Archived from the original on 2012-02-12. Retrieved 2012-02-04. ^ "English Ales Brewery Monterey British Brewing Glossary". www.englishalesbrewery.com. Archived from the original on 2012-02-19. Retrieved 2012-02-04. ^ "Joseph Louis Gay-Lussac (1778–1850)". chemistry.about.com. Retrieved 2008-07-05. ^ Robinson 2006, p. 10. ^ Robinson 2006, p. 279. ^ a b Berry 1998. ^ "Alcohol Content In Beer". www.realbeer.com. Archived from the original on 4 July 2008. Retrieved 2008-07-05. ^ a b Peros, Roko (7 May 2010). "Calculate Percent Alcohol in Beer". BrewMoreBeer.com. ^ "Get to Know Your Alcohol (By Volume)". BeerAdvocate.com. 18 June 2003. Archived from the original on 3 July 2014. ^ "S.G. Table for Ethanol-Water". www.separationprocesses.com. Retrieved 2016-08-31. Hehner, Otto (1880). Alcohol Tables: giving for all specific gravities, from 1.0000 to 0.7938, the percentages of absolute alcohol, by weight and volume. London: J & A Churchill. ASIN B0008B5HOU. Berry, C. J. J. (1998). First Steps in Winemaking. Nexus Special Interests. ISBN 978-1-85486-139-9. Regan, Gary (2003). The Joy of Mixology. Clarkson Potter. ISBN 978-0-609-60884-5. "How do brewers measure the alcohol in beer?". HowStuffWorks. 12 December 2000. Jayes, Wayne. "Alcohol Strength and Density". sugartech.co.za. The Sugar Engineers.